Well finally we have an AI-backed legal research assistant with a boy’s name*, as global legal publisher vLex announces the launch of Vincent, which analyses legal documents in Spanish and English and is trained in the law of no less than nine countries including Spain, the US, Canada, Mexico, Chile and Colombia. It will compete with Casetext’s CARA and ROSS Intelligence’s EVA. 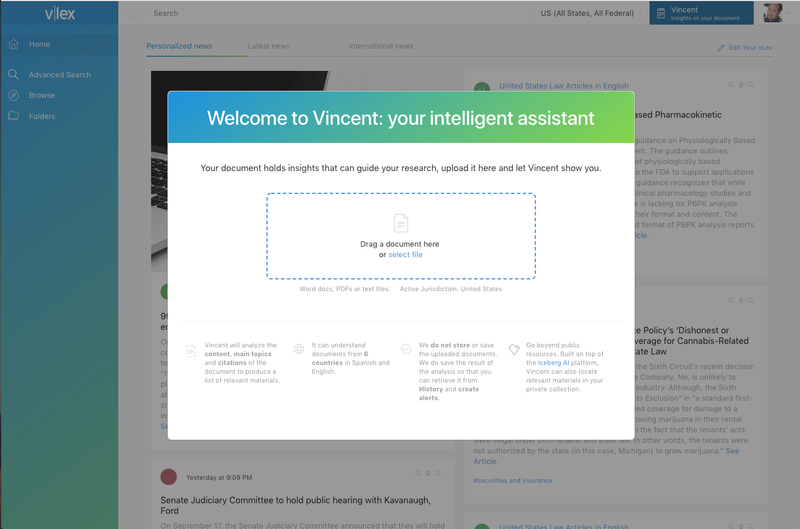 The team here at vLex is proud to introduce Vincent, the first AI-powered intelligent legal research assistant of its kind. Only Vincent can analyze documents in two languages (English and Spanish) from 9 countries (and counting), and is built ready to incorporate content not only from vLex’s expansive global collection, but also from internal knowledge management resources, public sources and licensed databases simultaneously. How does Vincent do it, you ask? Well, it’s been trained on vLex’s extensive global collection of 100 million+ legal documents, and is built on top of the Iceberg AI platform. And Vincent is just getting started. Why did we create Vincent? Vincent is the product of a multi-year research program at vLex, and a major innovation of the vLex Iceberg AI platform. It’s an advanced legal assistant that transforms and simplifies the legal research process. Vincent uses artificial intelligence, natural language processing and machine learning to help legal professionals quickly get to the answers they need alongside the most relevant and comprehensive supporting information. We know that legal research is a complex and time-intensive process. Vincent lowers the risk of making mistakes or simply missing something, and dramatically reduces the necessary time and effort to find authoritative and related cases, and valuable secondary sources. We built Vincent to deliver the benefits of an AI-powered brief analysis toolnot only within the United States but beyond, and we are privileged to contribute to a space pioneered by CARA (Casetext) and EVA (ROSS). What can Vincent do for me? Just upload a judgment, brief, legal memorandum or any other legal document and in a matter of seconds, Vincent finds and analyzes cited case law, extracts significant legal concepts, and uses dozens of additional criteria to generate the most relevant results from among vLex’s extensive libraries. Depending on your document and the jurisdiction, your results could include related legislation, case law, books and journal articles, contract models and more. Vincent is able to analyze documents (Word, PDF and text) in English and Spanish and is trained in the law of more than 9 countries, including Spain, the United States, Canada, Mexico, Chile and Colombia. Vincent can be directed to focus on the connection types, authorities and topics most relevant to you. vLex does not save the document, only the result of the analysis. You can consult that analysis at any time in your search history, and even set alerts to notify you when related relevant new cases have been published. How does Vincent do it? Vincent begins with the language of the case. It identifies main topics, recognizes citations and finds similar cases. Vincent then follows the trails to find connected cases and uses machine learning to produce a list of results that are most likely to be relevant to the document. Vincent transforms traditional keyword and boolean search into a much richer contextual search, one that begins with a document and is accelerated with artificial intelligence. Vincent performs a conceptual search for information as a human would, but is able to go further and faster by performing thousands of combined operations per second. Vincent helps you validate the quality and completeness of your own work, giving you greater confidence in your research, and an ability to develop a higher quality legal argument. Vincent relies on sophisticated algorithms that have been trained on vLex’s expansive content collection — over 100 million documents across all countries we serve, including legislation, case law, and extensive secondary materials. Only vLex has the depth of content, hundreds of millions of unique legal citations, editorial treatment, daily updates, and a local and global understanding to recognize legal concepts, at the necessary scaleto power Vincent. As Vincent is built on the Iceberg platform, firms can leverage its power not only across vLex’s extensive database but also use it to mine its internal knowledge management systems, collections of work product documents, licensed third-party databases and public sources. One fast comprehensive search that will give its members a unique competitive advantage. How can I try Vincent? Update: *it’s been a bit of running joke that legal research assistants have to have a girl’s name. Although as Dana Denis Smith points out on social media, the likes of ‘Ross’ or ‘Watson’ are named after men.